McKesson CEO's Pension Reported At A Record $159 Million : The Two-Way John Hammergren, the chairman and CEO of drug distributor McKesson, may have the largest pension ever reported for an individual, at $159 million. That's what he would have been owed in a lump sum if he had left voluntarily on March 31. 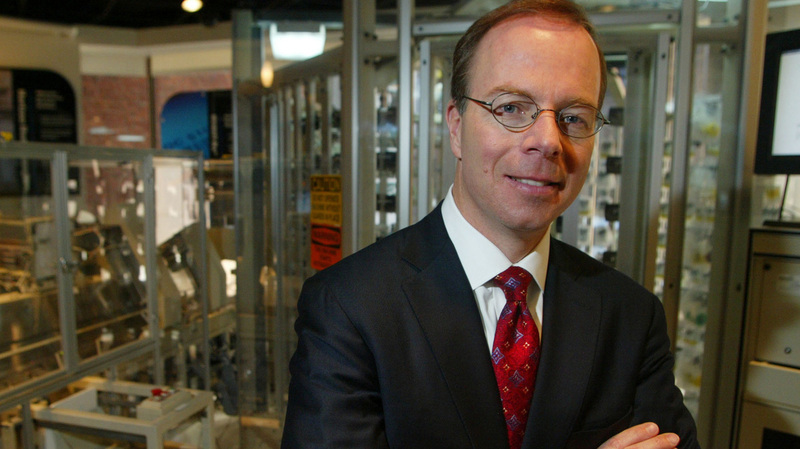 McKesson CEO John Hammergren, seen here in 2005, has what analysts call the largest pension on record, at $159 million. In his 14 years in a leadership role, the drug distributor's revenues have quadrupled. John Hammergren, the chairman, president, and CEO of drug distributor and health care services company McKesson, may have the largest pension for an individual on record, at a reported $159 million. The Wall Street Journal reported on Hammergren's pension Tuesday, citing company filings made last week. "Compensation consultants say it's by far the largest pension on file for a current executive of a public company, and almost certainly the largest ever in corporate America. It's also more than double the value of the 54-year-old Mr. Hammergren's pension six years ago." The newspaper adds that Hammergren was named a co-CEO in 1999. He is one of the highest-paid chief executives in the U.S. business world, making an average of more than $50 million each year. The recent accounting of his pension tabulated what he would be owed in a lump-sum payment if he had voluntarily left McKesson on March 31. McKesson currently ranks No. 14 on the Fortune 500 list, in part because of "a key contract with the Department of Veteran Affairs," according to CNN Money. In March, Hammergren's name was connected to another pension fund: that of New York City. The city's comptroller, John C. Liu, led calls to remove Hammergren and another member of Hewlett-Packard's board of directors, blaming them for the company's disastrous $11 billion acquisition of Autonomy. Despite being re-elected by shareholders, the two board members stepped down from their posts in April. The Journal notes that Hammergren's tenure has seen McKesson's stock triple, with the company reporting net income of $1.34 billion for the most recent financial year. But its analysis also found that the CEO's pension has been inflated by "several unusual factors," including crediting him "for extra years of service and for pay that he didn't receive." Citing executive pay tracking firm GMI Ratings, the AP reports that "54 percent of CEOs of companies in the Standard & Poor's 500 index have accumulated pension benefits. The average value of their pensions is just over $7 million, down from $11.5 million a year ago." The next-highest pension, the AP says, belongs to News Corp. CEO and chairman Rupert Murdoch, who would get $74 million. The AP also says compensation analysts call Hammergren's pension the largest on record. Hammergren is expected to speak at McKesson's Investor Day event Wednesday, which begins at 9 a.m. ET, according to a company release.